I’ve probably mentioned before that Christmas trees are my favorite part of the holidays. For a time, I had a Christmas tree, albeit some were quite small, in every room in the house. A few years ago, I consolidated those into the Big Tree and the Little Tree. This year, I’m adding Doug’s big-ish tree to the guest bedroom – so three of them – Papa Tree, Mama Tree, and Baby Tree. Nevermind, the baby is a mere 7’. I’ve loved Christmas trees for as long as I can remember. When I was a child, I was the first one to clamor for us to put up the tree. 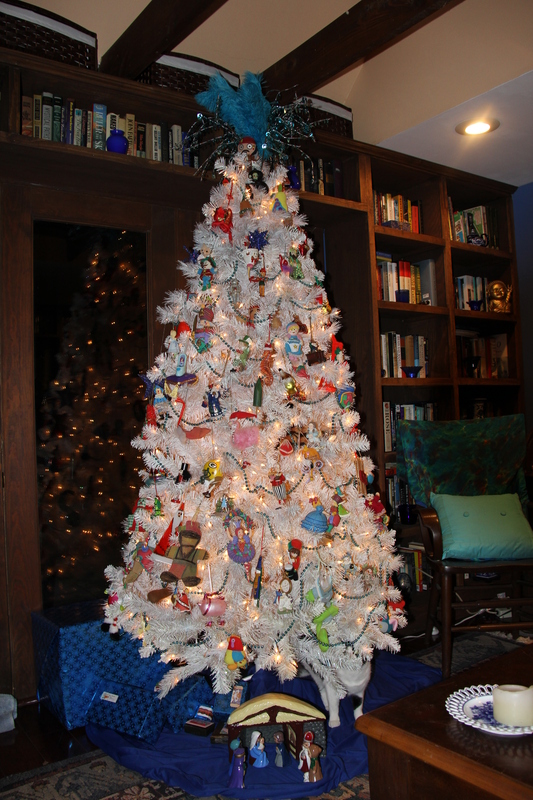 I was adamantly a real-tree person for decades until my carefully (and expensively) decorated tree fell over on me. As the ornament collection grew, so did their weight, and real trees just weren’t straight enough with heavy enough branches to handle it all. Enter artificial trees into my life. I’ve grown to like them, especially the pre-lit ones. They still take a lot of fiddling farting, but nothing like stringing lights. The ornament collection is out of control. I select ornaments based on events in my life, or my child’s, or other significant events. 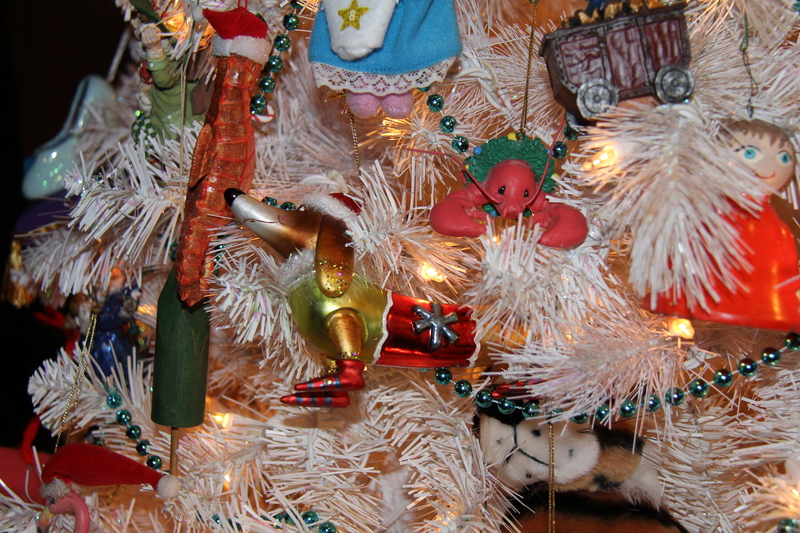 I choose ornaments as memorials to folks gone, ornaments of pets past and present, ornaments as souvenirs from vacations, ornaments of pop culture that caught my attention or my son’s. I believe my love of Christmas trees is genetic and Chef Boy ‘R Mine inherited the gene although it’s lying dormant right now. But when he was little, he was as entranced by the tree as I was. To protect him and the ornaments, I gave him a small, one-piece tree with battery-operated lights and a number of fabric ornaments that I procured from here and there. As Chef Boy ‘R Mine got older, his tree got bigger and his ornaments now icluded the stuff he made at school and collectible Star Trek ornaments I began buying him. While developing his tree, “my” tree continued to grow. I bought Wizard of Oz ornaments by the dozen to celebrate my love and my son’s love for the movie. 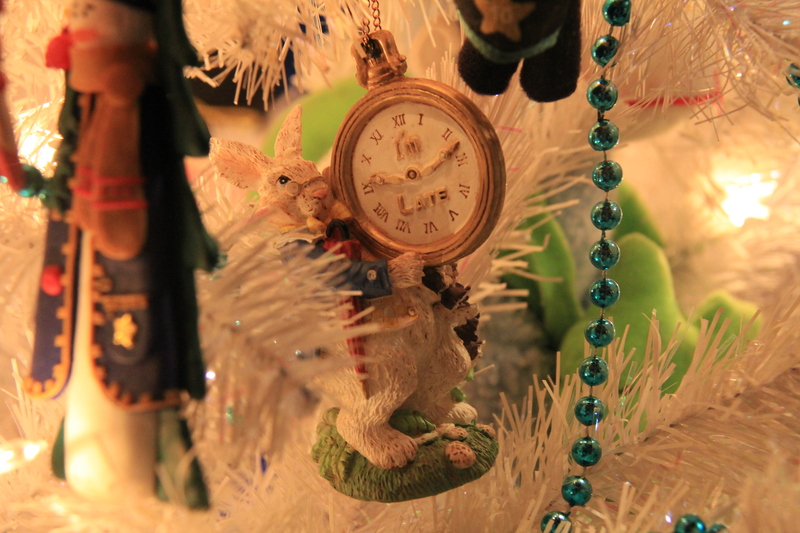 I bought Alice in Wonderland ornaments to signify the wonderful time he and I both had reading Alice aloud. 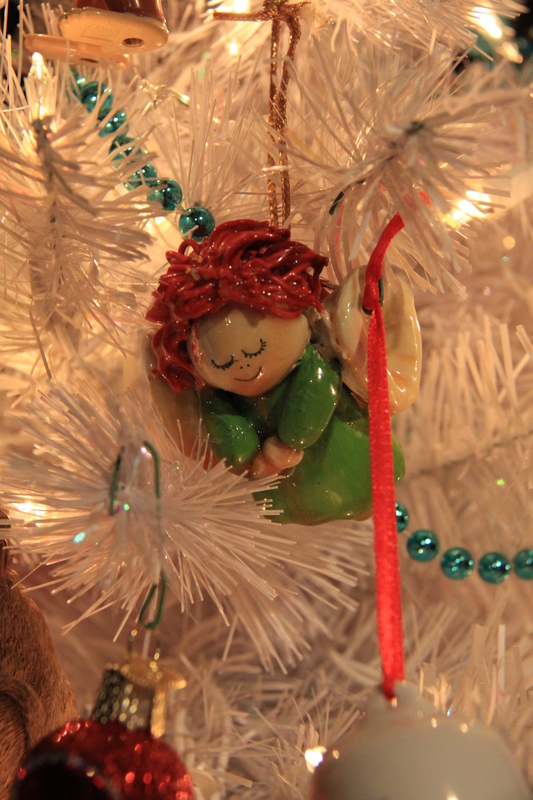 A few years ago, my mother gave me the ornaments she made for the family tree – precious little figurines of ceramic angels and wisemen and shepherds. When my son was about 9, I caught him and my manly-man brother lying on the floor engrossed in The Nutcracker Ballet – so engrossed they didn’t hear me ask them a question about dessert. The Nutcracker ornaments were procured. All of these and more are now the ornaments that go on the “Little Tree” – a white extravaganza of whimsy designed to appeal to children and inner-children. I usually put this tree up first and some years it’s the only tree that goes up. It’s bright and colorful. It’s cheerful. It’s friendly. It reminds me of my son and the best years of my life. Everything on the tree has some significance even if I can’t remember what it is. I should write this stuff down before I forget it all. I hope that Chef Boy ‘R Mine comes to his senses by the time he inherits all this stuff – I hope to see it loved for generations to come. The Big Tree is just as commemorative of my life, but more elegant and traditional. I’ve got the behemoth set up and arranged, but ornaments won’t go on until Tuesday. I don’t know that there will be time, but hopefully on Tuesday we can arrange the village that lives underneath it. Yes, I’ve arranged for help with the Big One – it’s overwhelming for one person.